Each year, starting around the end of August through Thanksgiving, we offer a variety of ways to purchase our pearfect� pears. These choices range from our special 8 pound gift box containing the very best of the best hand-packed Bartlett pears, the 28 pound tote, the standard 4/5th bushel pear box and even pre-ripened pears are available through the Saturday Portland Farmers Market. 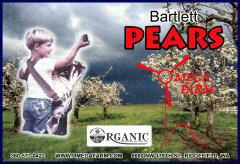 These WSDA Certified Organic gourmet pears are great for any occasion. We look foreward to satisfying your needs when we reopen again in late August. Another great way to find us is by coming to the Saturday Portland Farmers Market. We are there in season (late August until sold out) so please stop by and say hi. While there you can try free samples our tasty ripe pears. We bring a full truck load of great Bartlett pears ranging in ripeness from green right out of our cold storage to ripe and ready to eat. You can purchase them in any quantity and ripeness. It is a great way to buy pears, see happy people and you can also meet the best thing that ever happened to me.